Gremlins do inhabit Airstreams just like every other place in the world, and I suppose they are especially active at this time of year. After all, Halloween is this weekend and gremlin infestation is the only possible reason I can find for so many things going wrong in the past week. Let’s re-cap: failure of 3 clearance light bulbs, batteries in the TPMS sensors, O-rings in the kitchen faucet, one walkie-talkie, the Wilson Sleek 4G cellular booster, and the refrigerator. Plus hiccups in the GPS, one laptop, the Verizon MiFi, shower head, Tongue Twister, and a couple of broken leveling blocks. And then yesterday, when hitching up in a heavy rain (thanks to the remnants of Hurricane Patricia) when leaving Fred Gannon Rocky Bayou State Park in Niceville FL, I rushed the job a little too much and attempted to drive away with one stabilizer jack still down. Ugh. So that’s pretzeled. I whacked the stabilizer with a hammer a few times—not that it did any good for the problem but it was a good way to work off frustration—and then got out the old speedwrench and cranked the stabilizer up enough to be able to tow. That stabilizer looks seriously deranged and it will never work again. I’m hoping Airstream of Mississippi will have one in stock when we drive past there on Thursday. Despite the constant series of glitches capped by my own embarrassing mistake, as I was standing there getting soaked in the rain I felt that we’d reached a sort of turning point. It felt like I’d just hit a triple low biorhythm day and from here on things could only get better. It was time to reach out to friends and associates, and the ever-helpful Mr Google and Ms Amazon, and get back on track. 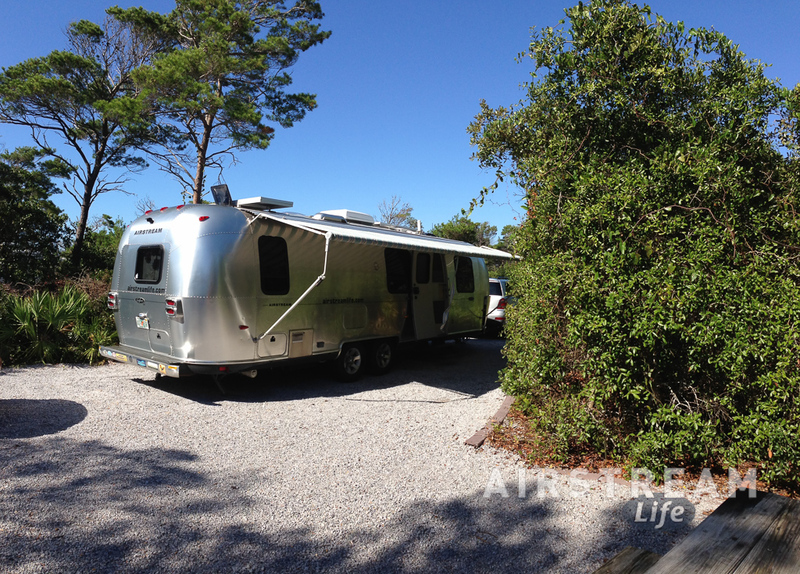 We set up the Airstream for a three-day stay on the Florida panhandle near the beach, and got busy. I ordered a few new parts to be delivered to our campground in Louisiana later this week, made arrangements to borrow a few sockets and wrenches I don’t normally carry, and we went to the local Wal-Mart to buy some Gremlin Repellent. It must have worked because a miracle occurred. After days of the refrigerator not working (repeated attempts) and no returned calls from Arcticold (repeated attempts), I managed to get Arcticold on the phone. They basically told me that what had happened to us couldn’t have happened, and asked me to do a test to verify the cooling unit wasn’t working. At this point the refrigerator had been turned off for about 30 hours since our last attempt. “What the heck,” I figured, “let’s make them happy,” so I turned it back on overnight and made a note to go buy an infrared thermometer in the morning. And of course, the refrigerator started working again. The damn thing was 27 degrees when I woke up, thanks to a combination of dry ice and a working cooling unit. I took out the dry ice and let it run all day and it stayed at 32 degrees. (3) Cooling like a glacier, and not even a “oh, sorry” from it for taking a multi-day vacation. Of course by this time we’ve eaten most of the good stuff in the freezer. Last night Eleanor made filet mignon wrapped in bacon with a gorgeous red wine sauce that had roasted garlic and mushrooms and … I don’t even know what else, but it was awesome. That went with little roasted potatoes and sweet squash and salad. Tonight we have salmon planned (it’s already defrosted so we have to eat it). I can’t complain about any of that. Now we’ve got a half-empty freezer and I guess that means we can stock it up with something else tasty. I don’t trust the refrigerator fully just yet, but I’m going to celebrate by buying some ice cream pretty soon. Take that, gremlins! “You appear to have the worst luck with refrigerators,” said my friend Tom from Huntsville, yesterday. Our trip southwest has been good despite being plagued with a few technological failures. First it was little things, like clearance light bulbs. Our Airstream is a 2005 so it doesn’t have LED clearance lights, and after a decade the bulbs are all starting to blow. I have replaced two in the last week with new bulbs from my spares kit, and it’s clear that I should just replace all of them at the next opportunity to borrow a ladder. Then Eleanor’s iPhone suddenly stopped receiving email. Then her laptop stopped being able to connect to our Verizon MiFi. While navigating down I-65, the car GPS suddenly couldn’t find itself. The batteries in the tire pressure sensors ran down. One of our walkie-talkies stopped working. The O-rings in the kitchen faucet started to leak. I started to feel the cold breath of a wizard’s curse on my neck. All of those problems were eventually corrected, but the whammy came at Mammoth Cave National Park when Eleanor announced that the refrigerator seemed unusually warm. Sure enough, the next morning it was unmistakable: the fridge was no longer cooling. This is our third refrigerator in ten years. The sad history of our refrigerators stems primarily from the infamous Dometic recall that doomed nearly a million refrigerators to early death because of welding problems in the cooling tubes. Fridge #1 died July 2008, fridge #2 died February 2015, and the replacement cooling unit that I installed in April 2015 died this week. Aha, you say—doesn’t it have a warranty? Yes indeed it does, a shiny “Lifetime Warranty” provided by Arcticold, the manufacturer of the cooling unit. And Arcticold goes further, promising technicians on duty “seven days a week, 9 to 9 Eastern”. A classic case of over-promising and under-delivering. I called twice on Friday, four times on Saturday, and left messages each day. No answers except a voicemail message that says they’ll call back in 1-2 hours. When I installed this cooling unit back in April I noted in this blog that I’d identify the supplier after I knew that they were OK, because the RV refrigeration cooling unit industry seems to be replete with scam artists and cheesy organizations. So now I’m identifying them. Arcticold, you failed me when I needed help. Fortunately I have more reliable friends, and (sadly) a fair bit of prior experience about what to do when the refrigerator stops cooling. The first step is always the same in any circumstance: don’t panic. There may be quite a bit to panic about, but try not to panic anyway. It won’t help. Look at our situation: 2,000 miles from home and enjoying the fall weather in a lovely national park. If we just freaked out and started driving home in a rush we’d ruin the rest of our trip. So keeping perspective helps. Yes, we have no refrigeration and a freezer full of expensive defrosting food. But we still have an Airstream complete with every other possible comfort of home. Our beds haven’t caught fire, our health is still good, the weather is fine … why ruin a trip for a failure of just one part? Step 2 is to do some diagnosis. Maybe the problem isn’t severe, and can be fixed on the road. It happens that the Winter 2015 issue of Airstream Life will have an article by Terry Halstead (AKA Super Terry) on refrigerator maintenance and basic diagnosis. That will be in your mailbox in November, but since I’m the publisher I have a copy on my computer and I pulled it up to run through the diagnostic steps. Alas, in our case the fridge’s two heat sources (electric heating element and gas burner) were both working perfectly, and there was no sign of a leak anywhere, which left only one conclusion I know of: the cooling unit had developed an internal blockage. If so, this is not repairable and it means the cooling unit is done. This shouldn’t have happened after only six months. A cooling unit can last for decades. The original fridge from our 1968 Airstream Caravel is still running up in Colin Hyde’s shop in Plattsburgh NY (they use it as a drink cooler). Running a refrigerator off-level can cause it to form a blockage but we’ve never done that. It has spent the last four months running perfectly level in Vermont. I can only conclude that this failure is the result of a manufacturing defect in the replacement cooling unit. Step 3: mitigate the damage. Eleanor keeps the freezer packed completely, which helps keep it cold, but it’s packed with filet mignon, sockeye salmon, premium ice cream, and various hard-to-find ingredients for the classically trained chef. We don’t want to give up on all that stuff unless we must. So our strategy was three-pronged: (a) don’t open the freezer until we have to; (b) figure out what we can eat and/or cook first; (c) get some dry ice. We were in Huntsville AL by the time we had a chance to really get serious about this, parked at the US Space and Rocket Center campground. It’s also useful to have a good wireless digital thermometer inside the refrigerator to monitor the temperature without opening the door. I found one at Wal-Mart for $10. Dry ice came from Publix in this case ($23 for two slabs of it, one for the freezer and one for the refrigerator). It only lasts about 24 hours but it works great. It kept the refrigerator compartment at 42 degrees, and keeps the smaller freezer compartment frozen solid. Before we found the dry ice we just grabbed a 10-lb bag of regular ice at the Mammoth Cave camp store, which bought us some time but only got the refrigerator compartment down to 52 degrees. You can also find dry ice at some Wal-Marts, Krogers, and Airgas (Penguin brand) locations. Eleanor spent Saturday morning cooking things while Emma and I visited the US Space & Rocket Center. We came back to a smorgasbord of delectables, which wasn’t bad at all. Our diet for the next few days may be a little weird as Eleanor finds ways to combine what we have into meals. Step 4 is to make a plan, and in this case we have decided to press on with our trip regardless of refrigeration. We’ll keep buying dry ice daily when we can find it, and use the refrigerator as an icebox. Later today or Monday Eleanor will stock the trailer with replacement foods that don’t require refrigeration. I have contacted friends along our westward route to work on getting a new cooling unit or an entirely new refrigerator. That’s still in process. With luck, we’ll have the problem fixed in a week or so. In the meantime, we’re going to keep having fun. Next stop, the beach! It’s always frustrating when you’re on a trip and something goes wonky in the Airstream. It used to drive me absolutely batty in the early days because I never knew how to fix anything. I remember that early in our full-timing experience (November 2005) we had a defective kitchen faucet and had to resort to calling in a mobile RV service technician in Oregon to replace it. That was a bigger hassle than it might seem because we were in Jedediah Smith Redwoods State Park in northern California and (at least at that time) there was no cell phone service in the park. I made a few calls from the payphone in the park (remember payphones?) which was in itself a sort of adventure. We finally ended up moving the Airstream to the town of Eureka so that the tech could meet us there and fix the problem. Our trip got disrupted, we had to pay $200 for parts and labor (later reimbursed under warranty), I had a hell of a time with a payphone, and we lost a day. Now it’s ten years later, and we are traveling through Kentucky. Eleanor noticed yesterday that the same kitchen faucet is dripping at the base and leaking down into the cabinet below. But something is different now: we have a lot more experience and tools on hand to deal with things like this. I got on the Internet to get Moen’s instructions, which are accurate but lacking in details for the novice. The basic solution to the leak is to replace O-rings, which isn’t terribly hard once you know how the faucet comes apart. The real trick was finding the parts. Being on the road makes it hard to get things via mail order, so rather than ordering Moen’s repair kit I had to figure out which size O-rings are needed and find them locally. That’s why I’m posting this blog. If you’ve got the same Moen PureTouch filter in your Airstream kitchen (which is a single-handle chrome unit with built-in water filter), let me just save you some time and say that you will want one O-ring in the size 1-1/16 x 13/16 x 1/8 and one O-ring sized 1-1/2 x 1-1/4 x 1/8, plus a small container of pure silicone grease (not petroleum based grease of any type). I found all of these parts across the street from the General Butler State Resort Park in Carrollton KY at 8:00 this morning. The hardware stores often have “Moen repair kits” which include the O-rings you need. Otherwise you can pick the O-rings out individually from the parts bin. My total cost including a small tub of silicone grease was about $7. Taking apart the faucet is easy when you know how, which is to say that it took Eleanor and I about ten minutes to puzzle it out the first time. Most parts just unscrew. See Moen’s parts diagram for help. There are also lots of amateur instructional videos online, but sheesh, some of them are longer than the entire job. I didn’t watch any of them since I didn’t want to burn a gigabyte of my precious cellular Internet allowance listening to some guy say “uhhhh … ok … so here’s the screw and … uhhhh … I’m taking it out now …” for 30 minutes. A large set of pliers is handy for the mounting ring if it’s stubborn. We also needed a Philips screwdriver and a 7/64″ Allen wrench, and a small flat-bladed screwdriver to pry off the old rings. Don’t forget to grease the new O-rings completely before installing them. 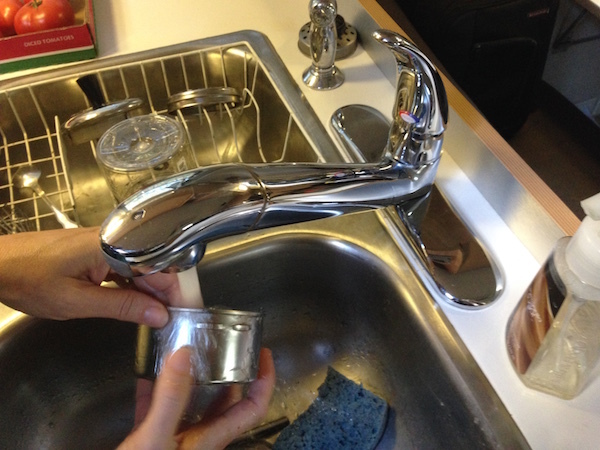 After replacing the O-rings we re-assembled the faucet and found the handle was on backwards. So we took it apart again and found a very very tiny embossed indication on the white plastic ring in the handle mechanism that said “TOP BACK”. This time it took only a minute or two to re-assemble the entire thing, thanks to experience. I want to emphasize that the real difference between now and ten years ago is mostly my attitude toward repairs—and the ever helpful Mr Google. I didn’t know how to fix this faucet yesterday but at least I had a sense of where to start looking. Now I see how easy it really was, and I wonder why I ever thought I had to call an RV service tech for simple jobs like this. The job was done before 9:30, which in my world means “before the teenager has awoken.” Now we are reviving her with hopes of getting to Mammoth Cave National Park this afternoon. It’s a great feeling to have fixed a problem ourselves, in about an hour (including going to the hardware store), and for $7. We didn’t lose a day and we learned something new before breakfast. That’s a good start. Through September I kept saying, “We’ve got to get out of Vermont by mid month or things are going to get tricky.” It wasn’t really news. After living in Vermont for years we all knew precisely what was coming, and when. The campgrounds shut down, water hoses freeze, and in an RV the daily propane burn becomes enormous. The benefit of waiting was beautiful foliage everywhere. 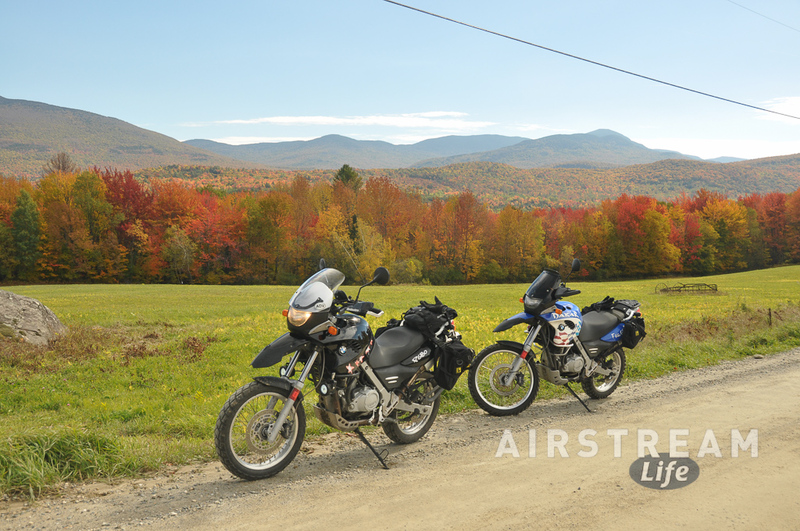 My brother and I took a last ride on the BMWs just to tour some of the dirt backroads of central Vermont and see it at peak. Departing this late is always a dangerous game, as sudden weather changes are to be expected in fall this far north. We picked Friday Oct 16 as our departure date and it seemed like a good bet until we got to western Pennsylvania along the shore of Lake Ontario on I-90. Then we hit a sudden storm of sleet and ice pellets. Eleanor and I watched in horror as the temperature plummeted from 47 degrees to 33 degrees in less than five minutes. 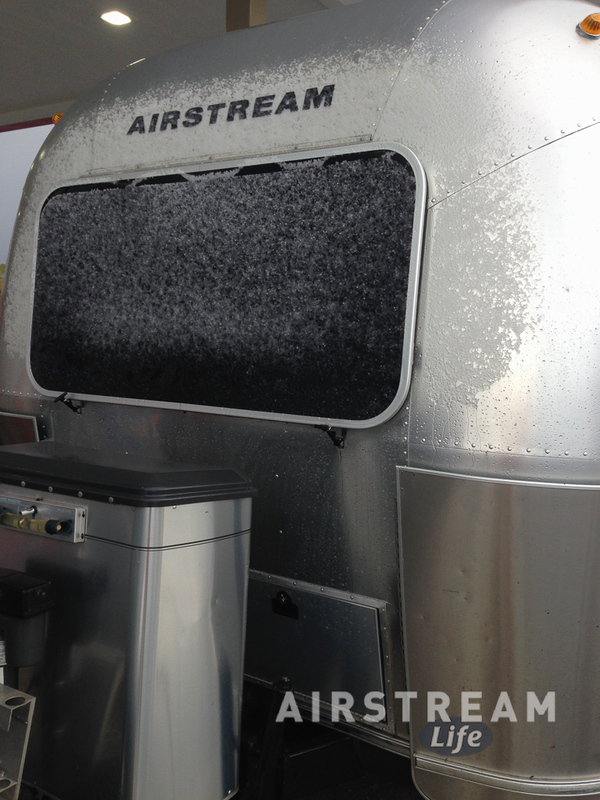 Heavy sleet was pelting the car and the front of the Airstream, and covering the road in a rough sheet of treachery. When that happens you have to start looking for options to bail out. There is no point in plowing forward with a trailer in tow when conditions are that bad. We got off at the next exit and filled up with fuel (where I took this photo). Ten minutes later the storm had passed. It was just a little reminder of how things can change quickly in the north in October, especially along the shore of a Great Lake that produces its own special weather. Sleet in October? I wouldn’t have been surprised up in northern Vermont, but down in Pennsylvania I felt fairly immune. I won’t make that mistake again. For the rest of the drive along the lake and past Cleveland we were in and out of storms. We pulled over a second time at a rest area to consider options again, and decided that we’d make a choice at the split of I-90 and I-271. If the weather continued as it had, we’d spend the night boondocking at one of the usual commercial establishments known to allow overnight parking and we’d call our friends to tell them we weren’t going to make it to their house that night. Far better to disappoint your friends by saying you’ll be arriving the next day, than to call them to say you won’t be arriving at all because you slid off the road. “Get-there-itis” is often fatal. By the way, this experience is a very good reason to travel with both propane cylinders as full as possible during the late fall and winter season. You can easily find yourself spending an unexpected night along the road with only your propane supply to keep you warm, and on a freezing night the furnace will burn a lot of it. In this case we were lucky. The weather got better as we turned south away from the lake, and we were rewarded with a spectacular sunset, and we made it to our friends’ home with no problems. 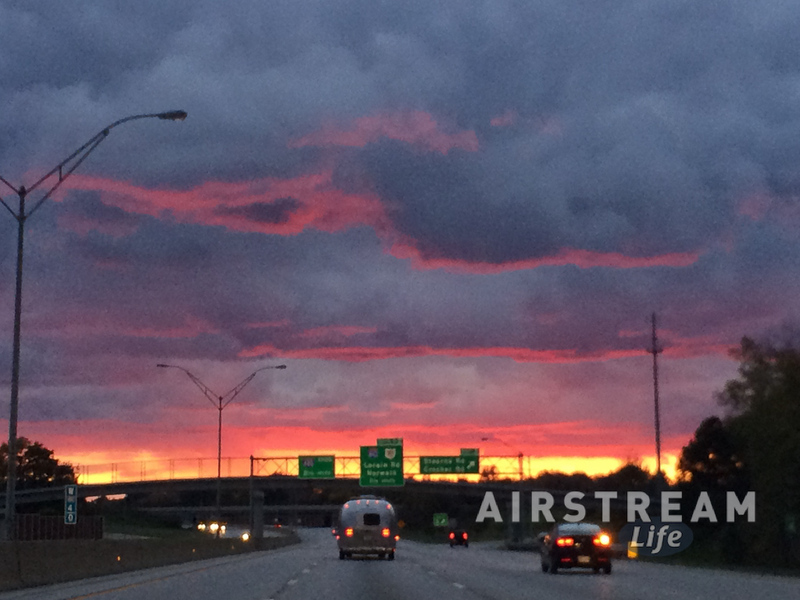 Here’s one shot of us towing happily to the west, near the end of the sunset and a safe trip. Now, two days later, we are in Jackson Center at Airstream. It’s not any warmer here. Last night I had to disconnect the water hose because it would have frozen solid. I’ve got a day of prep work to do for Alumapalooza 7, and then we will make a rapid exit to the south with the beaches of the Florida panhandle on our minds. We are definitely “chasing 72 degrees,” as many full-timers do. It is Fall in northern Vermont, just past peak foliage season, and that’s a clue that we are overdue to get rolling southward. The air has gotten distinctly chilly and the blustery winds that swirl the fallen leaves around are making it seem even colder. Believe it or not, winter is not far away. It tends to happen suddenly. I remember many a Halloween night as a kid, with snow flurries landing on my costume. The state parks in Vermont close early because of this. Many closed yesterday and many more will close this weekend, as the trees go bare and the leaf-peepers head back home. The commercial campgrounds tend to follow suit, so we may have trouble finding places to camp until we get to Pennsylvania or Virginia. That means this week is dedicated mostly to prepping to go. All of our belongings that have gotten scattered through the house and all of the “stuff” we have accumulated has to found, culled down, and re-packed for travel. That alone takes Eleanor and Emma several days. Then there’s a round of final goodbyes to friends, last-minute errands, and of course getting the Airstream ready to hit the road. There are two jobs that always come up at this time. The first is cleaning the roof of the Airstream. It spends the summer under cedar and locust trees that copiously drop branches and leaves on the roof. This begins to turn to mulch in the frequent rains, and the tannins stain the solar panels and roof. So I always have to get up on the roof and carefully sweep it clean, then scrub it down, without sliding off and injuring myself. I did this job yesterday during a brief warm up to 72 degrees (the nice weather lasted a few hours, then went back to the usual gray and breezy 58 degrees). During my roof inspection I found that the metal TV antenna support that I used to attach our cellular antenna has broken. Metal fatigue occurred in one of the 90-degree bends, leaving the support and the antenna a bit wobbly. It’s still serviceable for the moment but I will have to design a fix for it in the next few weeks. I also noticed that the sealant around the antenna base is pretty bad, so that’s going to need replacement too. In my book, The (Nearly) Complete Guide To Airstream Maintenance I have a section all about roof inspections (and other types of inspections) which explains what to look for when you are on the roof. I recommend that everyone do a roof inspection at least once a year. Lots of problems start on the roof, unnoticed until it’s too late. The second job we always have to do is eradicating the Mouse Of The Season (MOTS). We always get one in the late Summer or early Fall, except in the years when we get three. Rodent visitors are a fact of rural life, and they particularly love Airstreams. If you were a mouse, you would understand the appeal: lots of fluffy pink fiberglass insulation to burrow in, plenty of food in the cabinets, and no predators. This year’s MOTS made his presence known a few days ago when Eleanor discovered sunflower seeds under the bed. We cleaned up the little stash he’d left, but couldn’t find a nest. For the past three nights I have awoken in the early morning to hear the unmistakable scritch-scritch sound of a mouse chewing on something that belongs to us, so we’ve torn the front bedroom apart looking for further signs. Usually it’s easy to find Mouse Ground Zero: plenty of tiny droppings and shredded nest material, but this time we have found nothing. I was tempted to ignore it because the mouse will leave voluntarily when we start to tow on Friday, but then this morning he crossed the line. While sleeping at 6:10 am I felt something in my hair and brushed it away. MOTS was knocked clear by the impact of my hand, and we both had a bit of a shock. The thing he was investigating turned out to be alive (me) and of course I awoke to realize I had a mouse in the bed. He made a quick and invisible getaway of course, but then further invited my retaliation by going back to his hidden spot and making munching noises again. That sort of poor judgement has sealed the fate of many a house guest, and this case will be no different. MOTS must go. Of course there are other jobs to do before a long trip, but they are simple. Water, propane, cleaning, lubing the hitch, clearing off the spider webs, testing the systems that have not been used in a while, and such basic stuff. By Friday we should be ready to move out, and the Airstream will begin its 2,000+ mile journey back to Arizona, with stops along the way to be determined.